The instant pot is awesome! Truly! For example, I give you Instant Pot Spaghetti! 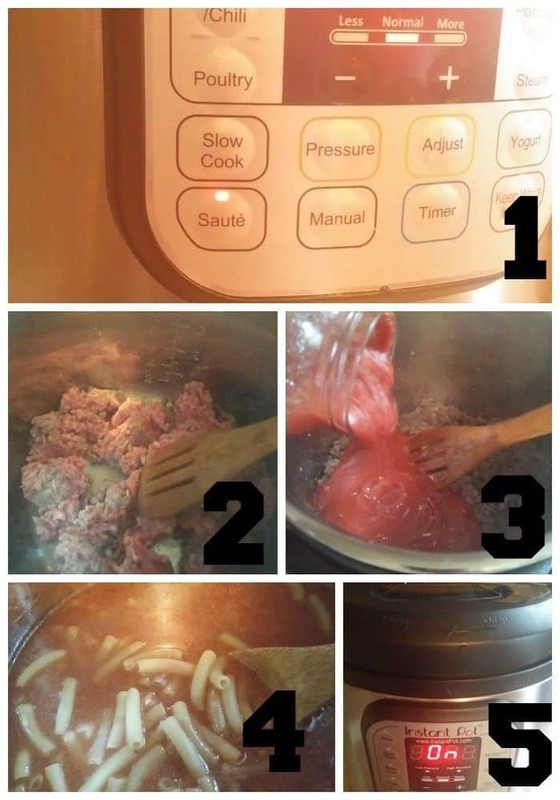 AKA, Instant Pot Penne Pasta With Meat Sauce. It’s like a dream come true, really. I am talking about the Instant Pot, the electric counter-top pressure cooker. (you can get one for yourself here!) My hubby bought me one for Hanukkah, and I totally love it! It’s made some of the most tender roasts, flavorful broths, hearty soups and chili that I have ever tasted. And all without adding heat in the kitchen, or having to stand right next to the stove and “babysit” a pot. I was a little intimidated at first, but once I got the hang of it, there seems to be nothing you can’t make with this little wonder! My favorite food to make is spaghetti. It’s truly one of the easiest pasta recipes for dinner. While I am not a huge spaghetti fan myself, my kids and hubby enjoy eating it. It’s fairly frugal, easy to make, and filling. But, there is the drawback of browning the meat and warming the sauce in one pan, and boiling water in a pot for the pasta. If it’s summertime, adding in all that hot humidity makes my kitchen a sweltering nightmare. The Instant pot makes that job so much easier. I can brown the meat, and cook the pasta all in one pot. AND, all without having to stir the pasta. Try another delicious recipe for your InstantPot…BBQ Chicken Sliders! Get it here. First, there are several models. This is the one that I own and will be talking about with this recipe. If you want to know where to buy an instant pot, you can grab your own from my affiliate partner by clicking on the link. Now, how to make pasta with meat sauce in the Instant Pot. First, turn the pot on to saute. When the display reads “HOT,” add in your meat to brown. If you want to add onions, garlic, or other veggies to your sauce, add a bit of oil, sautee them, and then add your meat to brown. Once the meat is all browned, you will add your sauce. I have used a one-quart jar of sauce or 32 ounces. Learn how to make and can your own homemade spaghetti sauce here. To get the pot to “pressure,” you will need liquid. The amount of liquid will vary, depending on the recipe, but for this one, you will add your 32 ounces of sauce PLUS 32 ounces of water. Then, you add your uncooked pasta. I use Tinkyada brown rice pasta as we eat gluten-free, and it holds well under pressure cooking. Close the lid on the Instapot. It will play “music” when the lid is in the right position, and again when it is locked for pressure. At this point, I have to turn the saute off by hitting cancel and then hitting the manual button. Push the “-” button until you get to 6 minutes, ensure the valve on the top is locked to hold in steam and walk away. After 6 minutes, turn the valve to reduce the pressure manually and stir. You will have the most delicious pasta that has infused with the sauce! Be careful when eating, as it is REALLY hot, though. Enjoy! Heat the Instapot by pressing the Sautee button. When the display reads "HOT", add your meat to brown. Add your sauce and water to your browned meat. Close the lid on the InstaPot, ensure the valve is closed and choose the manual button. Select the "-" button until you get to 6 minutes. When the time is up, release the pressure manually. What is one of your favorite easy, fast pasta recipes? 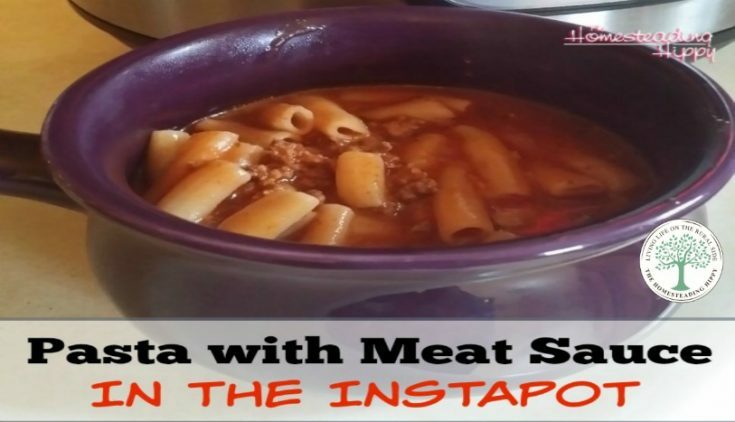 Will you try this Pasta with meat sauce? BE SURE TO PIN THIS AND CHECK OUT OUR INSTANT POT BOARD! I’ve just had mine for about 2 mos. & love it. Makes perfect brown rice, also the richest chicken stock! I make all our stock for soups, gravy,risotto, & add ins for casseroles etc. with the Instapot no mess, no skimming,no hot kitchen! In one hour the stock was ready. Watch Amazon for deals. I got mine for $30. less than regular price. It’s been a lifesaver in my kitchen! I’ve never heard of an InstaPot before! it’s amazing! I had only known about this for a short time before I decided to try it! I love my IP. I’ve made pasta with sauce and it’s good. We are mostly veg so I use it for grains, beans and legumes. Brown rice with lentils is a favorite. I steam large amounts of kale to prep for freezing in no time. It’s easy, safe, and once you get the hang of it, really changes the way you approach cooking. Oh, and I think your photo is great-you look like you’re ready to take on the world. This looks delicious. My husband loves pasta and I am going to try this over the weekend. This turned out amazing and was SO easy! Bought my IP about 2 weeks ago and have been trying out lots of new recipes. This one will definitely be in regular rotation! Family of 4 gobbled it ALL up and I’m left with only ONE pot to wash! What a bargain! Thank you! We are a family of 2. How does the Instapot handle smaller amounts? Could I cut this recipe in half? Or does it need to be more full for the pressure to work? I’m nervous to cook pasta in my instant pot because the first time I did, it spit and foamed out of the valve when I did a quick release. Any tips? I’ve been making lots of meals this way, adding in the starch with extra water to cook while protein/veggie cooks. You can also do rice at a 1:2 rice :water ratio, it usually cooks in about 15 minutes. I was cooking beef with broccoli at the same time, too, so it became a one pot meal. It looks easy to make! will try it tonight for sure!! The best part about this is you only have 1 pot to wash when you are finished. Now can spend more times with my kids. If you are fond of meat sauce or simply want to enjoy a good plate of mouth-watering pasta, you just have to try the vermicelli with meat and spicy sauce! Wonderful recipel. My husband and friends love this much. The taste is awesome. This is what I am looking for to make in my cooking list. This looks yummy! I’ll try to made it. 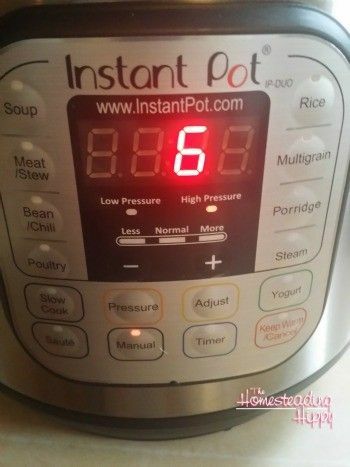 What size instapot did you use ? ?